Migration from classic W/H tax is possible but not vice versa. 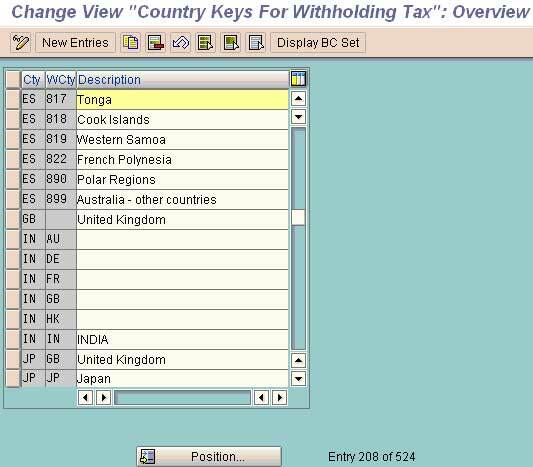 Check the country code specified by the system for a country specific. If not there create new. Define Withholding Tax Type for Invoice Posting. Wonderful explanation!. Thanks a million. details of Expenses Code against each tax Deducted at Sources. I have searched in J1INMIS , but this gives vendor wise TDS information. I want to know the withholding tax concept in India. if so what will be percentage. Execute the program in SE38, RFTW0010, select the Vendor code & tick in Vendor Check Box. First run in Test Mode & then in Updated mode. for that i am using T Code J1inqefile. The E-file is generating in system in old text format, but i want it in new format. Could you please help ????? Request help on TDS returns to be filed & Certificates to be generated, for freight provisions for which open items exist, however with no reference to vendor or Purchase order. These provisions are created during STOs or Sales Billing. Thank you for u r efforts giveing informations I Know total configuration total withholding tax but only diduct 2% TDS from vendor invioce or payment ok hear special i want to lear how to configure surcharges and cess at the same time how to generate tax Forms please help any one. please cofiguration information send to my mail id maddineni.sapfico@gmail.com.